It’s important to learn as much as you can about your condition. That includes understanding your symptoms and how RA affects your body. Knowing more can help you talk with your doctor about the treatment that’s right for you. What happens when you have RA? Normally, your immune system works to protect your body from foreign substances like bacteria, viruses, and germs. While the exact cause is unknown, when you have RA, your immune system attacks healthy tissue and cells in your body. That’s why RA is called an autoimmune disease. 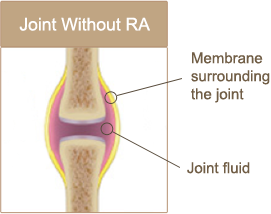 RA primarily affects the smaller joints of the hands and feet. The membrane (thin tissue) around the joints become swollen and inflamed. This leads to the pain, stiffness, and swelling many people with RA experience. For example, if a joint in your right hand is inflamed, the same joint on your left hand may likely be inflamed, too. 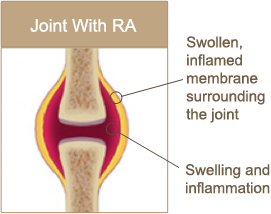 RA can occur in any joint. But it usually starts in joints in your fingers, hands, wrists, and feet. 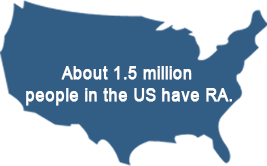 The joints that RA affects can vary from one person to another. Some people have more severe symptoms than others or have symptoms more often. For many, stiffness is worse in the morning, or when they haven’t been active for a while. RA usually starts between the ages of 30 and 50. RA is a chronic long-term disease. If the joint pain, stiffness, and swelling symptoms are not caught early, they can worsen over time. That’s why early diagnosis and treatment is important. While there is no cure, there are medicines that can help relieve these symptoms. This may help you perform everyday activities with less difficulty.